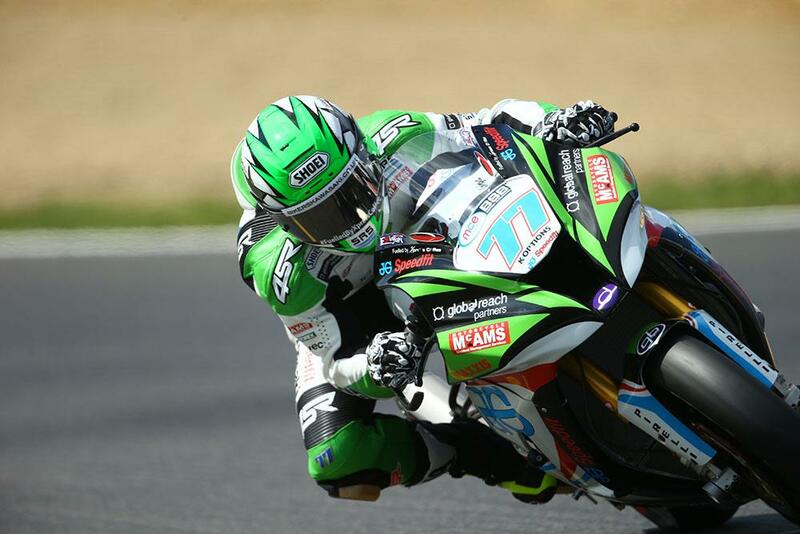 JG Speedfit Kawasaki rider James Ellison has blitzed the lap record on his way to pole position for tomorrow’s opening MCE British Superbike race at Brands Hatch, bettering the lap record not once but three times. "I honestly wasn’t expecting to take pole position, but every time I went out on the bike, I just felt really comfortable. We’ve not really found anything big this weekend, we’ve just really gelled with the Kawasaki from testing and we’ve significantly improved the bike from last time we were here. We’ve been running really consistent times and we know we can run at least ten laps at this pace. He held off an impressive Jakub Smrz in second, showing his promised form on the Lloyds British Moto Rapido Ducati, only 0.02 ahead of Ryuichi Kiyonari on the Buildbase BMW. Josh Brookes was fourth on the Milwaukee Yamaha, ahead of the unhappy PBM Kawasaki pairing of Shane Byrne and Stuart Easton. Jason O’Halloran was a surprise seventh, heading Christian Iddon, disappointed after a Q2 lap that would have left him on the front row, and the second Milwaukee Yamaha of Broc Parkes. Jack Kennedy rounded out the top ten, making it to Q3 for the first time. There were some big casualties of the day, though, with Chris Walker back in seventeenth, Peter Hickman in twenty second, and Michael Laverty all the way back in twenty seventh after brake problems on the Tyco Suzuki.